Opel will launch the next-generation of IntelliLux LED® lighting with the all-new Insignia in 2017. In addition to the numerous benefits of the award-winning matrix technology introduced for the first time last year on the Astra, the even more refined and sophisticated IntelliLux LED® headlights of the new Insignia feature additional functions that further improve nighttime visibility. When Opel revealed the visionary Monza Concept at the 2013 IAA and CEO Dr. Karl-Thomas Neumann announced it showed what could be expected of Opel cars in the future, the company’s exterior lighting experts were not only enthusiastic. They were just putting the finishes touches to the (in the meantime award-winning) adaptive IntelliLux LED®matrix headlights of the new Opel Astra, which consist of 16 LED segments – eight on each side of the vehicle – that automatically and constantly adapt the range and distribution of the light beam to every traffic situation. As they admired the show-stopping Monza Concept, Opel’s lighting experts also wondered just how they were going to fit their innovative matrix lighting technology for the next generation Insignia into such ultra-slim headlamps. Tailwind for Opel’s lighting experts and to the advantage of future customers of the new Insignia: LED development proceeds as fast-as-light. During the Astra’s development, LEDs had become even more compact and powerful, and Opel’s engineers used the significantly higher performance to accommodate twice as many LED segments (32) in the new Insignia’s Monza Concept-inspired headlights as in the Astra. As a result of the smoother transitions between the higher number of LED segments, the light patterns can be more precisely adapted. 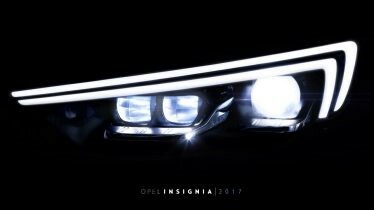 The adaptive IntelliLux LED® matrix headlights of the new Insignia therefore produce a larger amount of even brighter light. To improve visibility still further while driving through curves on full high beam, the engineers added a new function to the new Insignia’s IntelliLux LED® matrix headlights. The light intensity at the inner matrix segments rises according to steering angle in order to increase the illumination of the curve. Each IntelliLux LED® headlight also features a high-beam spotlight that provides additional illumination at full high-beam for up to 400 meters, further improving the new Insignia’s long-range visibility. Despite the futuristic DNA from the visionary Monza Concept, the adaptive IntelliLux LED® matrix headlights of the new Opel Insignia could not be simpler to operate: As soon as the car exits urban areas, the IntelliLux LED®headlights switch themselves on automatically and then constantly adapt the range and distribution of the light beam to every traffic situation, whether driving in town, on country roads, on the motorway, making a turn or taking a curve. Literally turning night into day for the new Opel Insignia – but without dazzling other road users.